Jupiter’s Pick: Rainy Day by Thais Weiller & Amora B. You know those days where you don’t want to get out of bed, where the whole world seems to be working against you? In Rainy Day, you are facing one of those days. 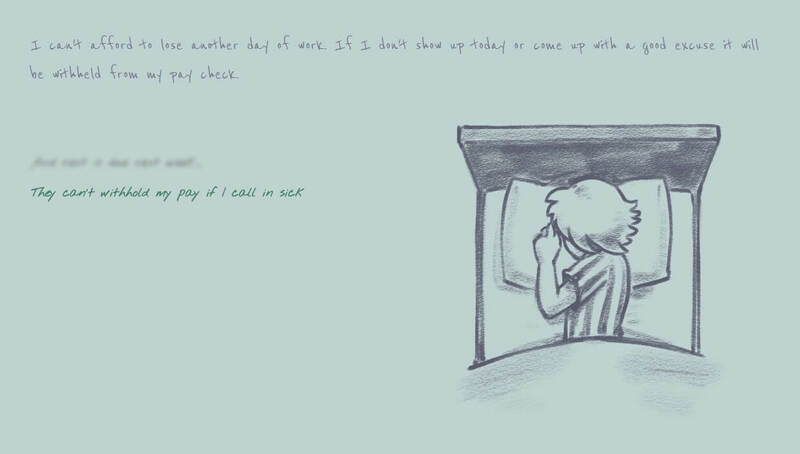 Rainy Day is an interactive fiction where you are deciding if you want to go to work. You start by waking up in bed, knowing you have a full day of work ahead of you. But today, like most days lately, just isn’t your day. You’re tired, exhausted and in a bad mental state. You want to go back to bed. But work pays your bills — and bills are always looming. You must start to make decisions about how to go on with your day. Not all of the decisions can be seen right off the bat — you need to scroll over your options to actually see what they say. Everything is a fog at first, of decisions you need to try to clarify and make. Along the way you might decide to get dressed or cheer yourself up. Sometimes, this results in more negative thoughts about yourself or your surrounding — while other times you just can’t actually accomplish what you have chosen. Rainy days are hard days. They start off so gray, full of fog, and sometimes full of sadness. With multiple different endings, you can try to find your own path through this gray day. You can play Rainy Day for free, on itch.io. Do you miss the days of playing games on your old Nokia phones? Whether it was the 6010, 6030, or even the 3310, many of us remember booting up old 1-bit games on those devices as children. Appealing to that nostalgia was the goal of the recent Nokia 3310 Jam on itch.io! Let me tell you, seeing some of those entries brings back so many memories of our first mobile games. This one in particular stood out to me, though. Not that it was overly complex. Not because it was graphically impressive, but because it was simple and extremely well designed. Puzzle games are some of the most difficult games to design, at least for myself, as you have to find a good balance of pacing and difficulty, while being creative with your mechanics. Making the game overly complex will frustrate players. Making it too difficult, too fast can cause them to give up and never pick it up again. This is where CloneDeath surprised me, though. Sokoban is only 10 stages, but CloneDeath uses the short game time to deliver a fun little brain teaser that will test your puzzle solving abilities. I found myself stumped for a while on the final stages, but not because they were too difficult. They just simply required me to think outside the box and really come up with a solution to my problems. If this game was on my 6010, back in the day, it definitely would have been in my library. If you like retro games like that, and like puzzle games in general, this little jam game will sate your sweet-tooth. At least for a little while. Has your recent life been devoid of badassery? 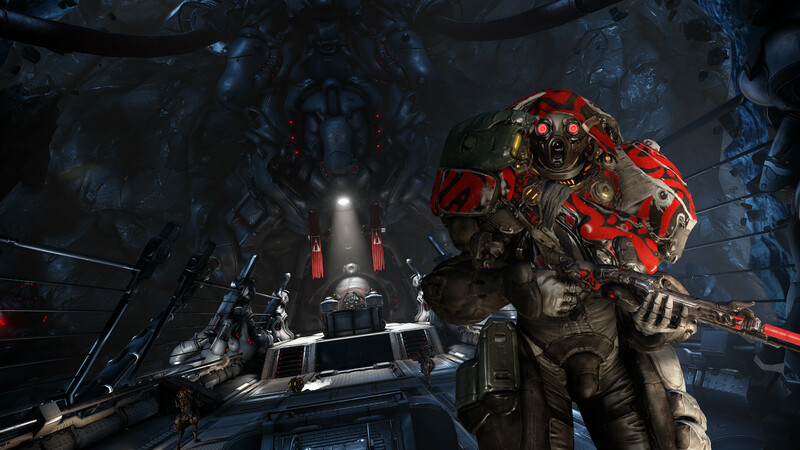 Look no further than Warframe, a free-to-play, sci-fi shooter by Digital Extremes. With the latest updates, this third-person shooter is basically a free-to-play version of Destiny, but with a lot more content and paid purchases are mostly cosmetic features for your character. You play as a Tenno, a slick, alien creature with a suit of biomechanical armor called a Warframe. Tasked with cleaning up the universe, and the various evil factions that are looking to tear the very fabric of it apart, you fly down to individual planets within our solar system to complete various missions. Mission types can vary between any of the twenty-one types of tasks, such as Extermination, which has you killing a set number of enemies and then extracting, to Defense, where you protect a primary objective or objectives. Weapons in Warframe are what makes everything come together. You have many different weapons to pick from, but they fall into three distinct categories: primary weapons, sidearms, and a melee weapon. One of the best offerings out of these is your bow, a fine weapon whose arrows can pierce enemies with such velocity that they send them sailing and often sticking into walls in the distance. You can also hit multiple enemies at once with your arrows, easily tending to a group running in a line at you during waves. Swords are a good fall-back weapon as your ammo is limited, but they also make hacking through groups of enemies with ease engaging and fun. All of the weapons feel good to use, and even though most enemies fall into that trope of being bullet sponges, the combat feels fresh and chaotic. Traversal in Warframe is what really turns the action up to eleven. Your Tenno can double-jump, wall-run, wall-climb, slide, and even fall in slow-motion if you draw your bowstring in mid-air. All this parkour-esque movement leads to fast-motion gameplay where you feel like the ultimate badass ninja, tearing through enemies while speeding through the relatively open environments. Warframe is a great game for quick, five to ten minute sessions and the online co-op play is smooth and rewarding. With the recent release of the Nintendo Switch edition, it makes slicing and shooting up bad guys portable, and is a perfect fit for the system. In fact, the Switch edition is likely the best looking game for the console, hands down. Download Warframe for free on the Nintendo Switch, Xbox One, Playstation 4 or Steam. Loading up Be You is curious right from the get go, as you are introduced to a meta-narrative, visual novel involving some strange events surrounding a birthday party. Be You has several different branches and lots of unique writing which seem like a wonderful mix of chaotic poetry, prose, and humor. 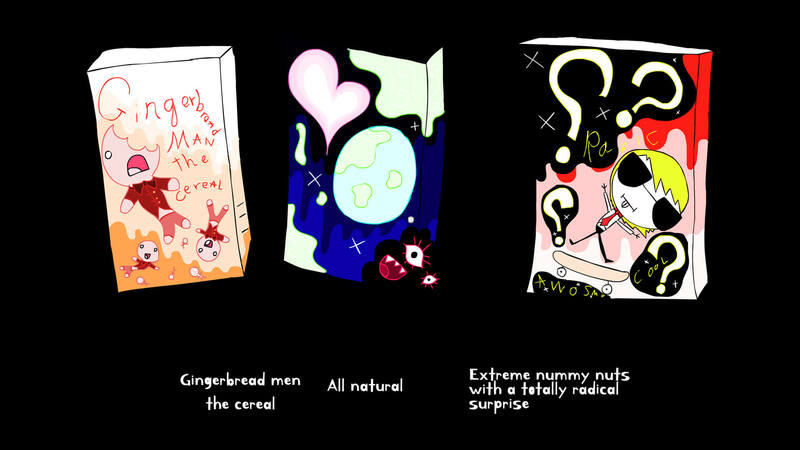 This game was made by Louis Morel (@louismorelart on Twitter), who has a surrealist style of incredibly inventive art and creative ideas, their characters spring to life with a fountain of design choices and ideas. This is a short game, allowing for several playthroughs and lots of different paths to take and endings. Take a trip down into Be You’s reality, and meet lots of amazing and quirky characters, monsters, and interactions by checking out the game on Steam for free! Slay the Dragon is a slot builder about defeating a dragon through cunning, coin and… stabbing with swords. It was actually my first slot-builder, a sub-genre which I had never heard of until I played it. Slot-builders, for the unaware, are like slot machines but with additional RPG-style statistics bolted on, and with some of the slots triggering events. In the case of Slay the Dragon there are coin tiles which give you gold which you can spend that turn, dragon tiles which deal damage to you, and merchant tiles which open up an area you can spend your coins on slot upgrades. The slot upgrades are quite clever, and I really like how the requirement of coins in the row you select (yes, you select which row to interact with, and which order to use the results) staggers your progress toward fighting the dragon. A typical turn will involve you spinning the wheel and selecting which of the three rows of four you select. If you receive a few coins then you can buy another coin onto the machine, or add in another merchant. After a few turns you’ll hopefully be grabbing enough coins to afford to add double and triple coin totals. There’s also the option to add in wizards, who destroy the slot tile to the side they are facing, and iron bars. Iron bars are the start of your journey to victory. If you have both an iron bar and a furnace on the same tile then using the furnace will refine the bar into a sword — use those on a dragon and you’ll destroy it, removing it from the slots. It’s surprisingly fun, and very quick to learn. Nephilim has made a tight, fun twist on a casino classic, and it is really worth your time. You can play Slay the Dragon on the Pico-8 website.